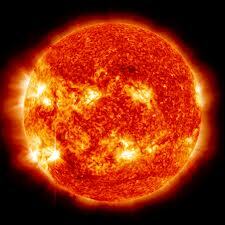 The Sun is un-doubtably the biggest object within our Solar System and the most powerful... If it wasn't for the sun there would be no life on Earth and there would be no us, for any life to evolve and develop you need an energy source and our sun is a power house of energy but the fact is its going to die in the next 5 billion years and if we as a human race want to survive forever then we will have to find another habitable planet which can harbour life and which has the right ingredients for life to evolve namely energy and liquid water. Our sun is called a "yellow dwarf", yellow coz its yellow in color and dwarf because its relatively very small as compared to other stars in our galaxy, the sun gets all its energy by diffusing Hydrogen atoms to make Helium and thus emitting photons which take roughly about 8 minutes to reach our planet and give us light but one day all that is going to end and our sun is going to enter a phase called a "Red Giant" phase where its size would expand to such enormous lengths that it would almost touch our planet.. of- course by then life on Earth would seize to exist and all that would remain would be hot molten rocks! Every star has a life span of about 10 billion years and since the formation of our solar system happened about 4.6 billion years back that leaves our sun with a little over 5 billion years to live and then eventually fade out as a small dot wandering the ever expanding universe, I am glad most of us wont be around to witness that which isn't a bad thing after all!